Early on in the Iron Man 2 film, we're treated to a sequence in which Iron Man falls to earth from a plane, avoiding mid-air explosions as the camera violently jerks around the protagonist. It's a dizzying, uncoordinated viewing experience, but at least you're only observing - try adding interactivity to the mix and it might be akin to the Iron Man 2 game adaptation’s most maddening moments. To be fair, Iron Man 2 is a somewhat better experience than its putrid predecessor -- the controls are fairly manageable this time around, while the more egregious controller-tossing objectives of the original are thankfully fewer in number. But that's as complimentary as we can be for this quick, unattractive slog through repetitive missions and even less interesting cutscenes. Dropping the film's plot in favor of an original story and bringing in Invincible Iron Man scribe Matt Fraction was supposed to make for an exciting, comic-flavored adventure. Instead, it feels like the characters and scenarios developed for the game were snatched from the cutting room floor for the movie; or worse yet, the first game. Tony Stark's main opponents this time around are rival weapons manufacturers and a hacked version of his JARVIS computer system -- not the exciting, iconic super villains we grew up reading in his comic adventures. In fact, aside from the handful of boss fights, we must've seen the same half-dozen or so standard enemy types over the course of the eight-mission campaign, which can be easily wrapped in about four hours. Iron Man and War Machine are both playable -- some missions designate a specific hero, while others let you choose -- and the ability to customize and upgrade their weapons and abilities is a nice touch, even if the cumbersome menus slow the process. 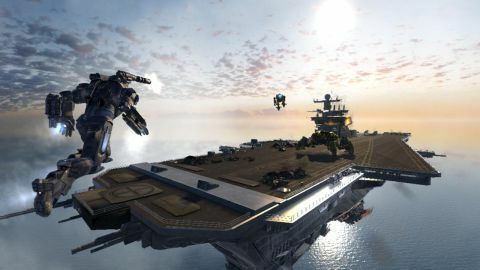 Taken individually, firing projectiles, launching melee combos, and hovering around all work reasonable well, but the dull missions don't make interesting use of these features, instead placing you in battle after battle against mindless flying robots and helicopters. Keeping track of enemies as they zip around you becomes especially unpleasant due to a terrible target lock system, which performs inconsistently and can make it extremely difficult to keep pace with a moving target. It essentially ruins the final battle, in which a simple act like landing at a nearby destination becomes an exercise in futility. To make matters worse, Iron Man 2 can be shockingly ugly at times, especially in the cut-scenes, which spotlight terrible effects, fuzzy and slow-loading textures, and choppy animations. We expected exciting characters and combat, co-op action, flashy presentation, and the dulcet tones of Robert Downey Jr., but Iron Man 2 offers none of these things. And frankly, it's not worth the four hours or $60 to find out what it does deliver.